In a small jug or bowl combine 1 tbs olive oil, mustard, Worcestershire and chicken stock. Heat a medium non-stick frying pan over medium-high heat for a couple of minutes. Add remaining 1 tbs of the olive oil. Add the potatoes, herbs and garlic. Toss gently to combine and coat in the oil. 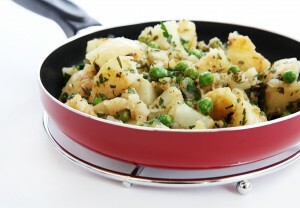 Use a fork to lightly crush the potatoes so they just spread but still have some bigger pieces. Allow to cook for a couple of minutes to get some golden colour on the potatoes. Add the drained peas and pour over the liquid mixture. Allow sauce to soak in and reduce until there is only a little liquid left. Toss gently to combine, season well with freshly ground black pepper and salt to taste and serve immediately.Tip: great served alongside grilled meats like beef, lamb or chicken.